I first met Eldean Kukahiko when KUAʻs office moved from the Box Jelly in Kakaʻako to the KEY Project in Kahaluʻu. Other than “hi – bye” kind of small talk, he and I never had a long engaging conversation. 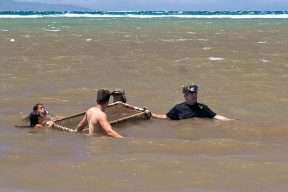 Then just a few weeks before this past June’s annual Limu Gathering on Lanaʻi, his son Kaipo told me about his dadʻs interest in trying to bring back limu to the shoreline along the Kahaluʻu community. So Eldean and I met and hi talked about how limu was abundant not that long ago and how sad he was to witness its decline. I could hear and feel his passion in wanting to bring back limu for his community. It was just by coincidence (or was it?) that the focus of this past Limu Gathering was on growing limu and starting limu restoration projects. With two weeks to go to the gathering, we invited Eldean to attend. He asked if his two friends, father and son, Peter and Ben Field could also attend. All three ended up coming to our gathering. 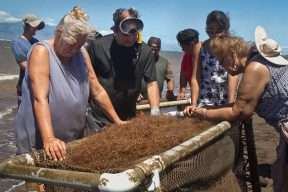 Within two days of their return from the gathering, they started their own limu restoration project in the Kahaluʻu. You can see in his eyes he’s thinking about the possibilities for Kahalu’u. Eldean’s interest in limu was all about his community and more specifically the keiki of the community. He spoke about wanting the keiki to be able to harvest limu and to taste limu like he once did. His strategy in limu restoration and passing on knowledge to keiki was to have them taste it. Once they get the taste they will want learn about limu in order to continue eating it. 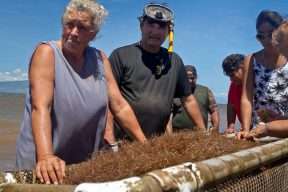 That was the same strategy he used to get them to want to learn about kalo and poi, “feed ʻem the poi and they will develop the passion to learn about it.” Such a kind and generous man who worked to uplift the community, who asked nothing for himself but asked everything for the keiki. On Saturday, October 8, Eldean went diving for heʻe off Kualoa Beach Park. When he didnʻt return, his family called the Rescue Department. His body was found in the water and all attempts to revive him failed. The Limu Hui, the Kahaluʻu community, all of Koʻolauloa, all of Hawaiʻi Nei feels the loss of this Hawaiʻian Warrior. For a few days after his passing, things were a little quiet at the KEY Project. So many people felt the loss of a great man. But after a few days we could again hear the laughter of young children, hear the sounds of the pu by the older ones and hear the constant chattering of kupuna at Friday’s Kupuna Breakfast. The work of this great man continues because Eldean was an inspiration for so many people who continue his work. A celebration of his life is scheduled for Friday, November 4, 2016 at the KEY Project in Kahalu’u, 47-200 Waihe’e Road. This entry was posted in Limu Hui. Bookmark the permalink. ← An Instrument of Aloha: Remembering Ernie Cruz Jr.
Wow, that is great, I hope this project continues. Back in the ’80s KEY had a limu restoration project with youth under the direction of Jerry Kaluhiwa. I believe Bob Nakata was executive director at the time. Jerry and Rocky are part of our Limu Hui. Unfortunately, both of them could not attend our Lana’i gathering. We look to both of them for their experience and guidance. 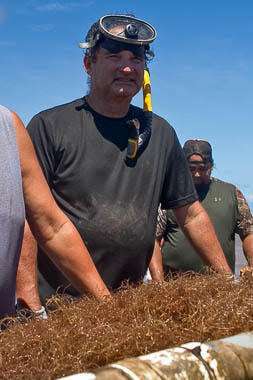 Eldean’s friends, Peter and Ben Field are continuing the limu planting effort in Kahalu’u.